Don Braben began painting ships at an early age, growing up on Merseyside, when Liverpool was a major seaport. Born in Wallasey in 1937, he contemplated a career at sea but decided to pursue studies in art and graduated from Art College with teachers’ qualifications and later a Masters degree. Don’s art teaching career took him from the United Kingdom to Nigeria, Zambia, Canada and Australia. He arrived in Brisbane in 1974 to take up a position as lecturer in Art at the Mt. Gravatt campus of Griffith University. In 1997 after teaching and developing drawing courses, Don retired to concentrate full-time on painting. 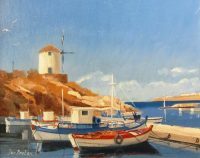 His experiences overseas and familiarity with different media has given inspiration for a variety of subjects although his favorite medium is watercolor. His first major solo exhibition was at the British Council in Kano, Nigeria in 1966 and since then he has exhibited in several other countries including Australia. His drawing ability led to book illustration for educational texts, instructional videos and national and international journal covers. 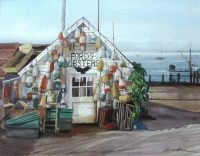 Don’s main interest is marine art with the emphasis on contemporary marine history. He has exhibited work with the ACTA Maritime Art Awards (1986-1991) and P&O Art Awards (1992) in Australia and with the prestigious Mystic Marine Gallery’s International Exhibition in the United States and Royal Society of Marine Artists in the United Kingdom. 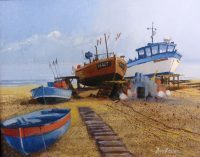 He is a foundation member, a Vice President and Fellow of the Australian Society of Marine Artists, a member of the International Society of Marine Painters, Watercolor Society of Queensland and Australian Guild of Realist Artists. Don’s award winning works have been shown in solo exhibitions in Brisbane, Sydney, Hobart, Newcastle, Noumea, New Caledonia, Granville, France, and Kobe, Japan. 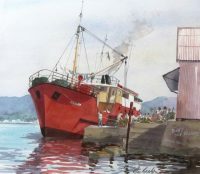 His work is in many private, corporate and public collections including Australian National Maritime Museum, Queensland Maritime Museum, Queensland Parliament House, Queensland Transport, Port of Brisbane, Adsteam Marine, CSIRO, AMSA, Royal Australian Navy, Wallenius Wilhelmsen Lines, United Service Club, etc.